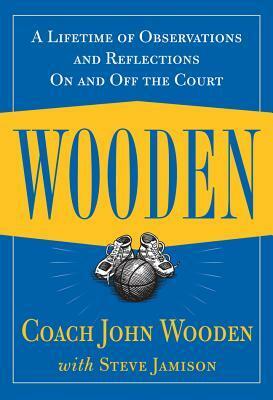 Wooden, by John Wooden with a foreword by Steve Jamison, is– well, in a way an autobiography of Coach Wooden’s life, yet this really isn’t considered an autobiography. To me, it’s a book on how to live a better life, during the good times of your life, and the tough times too. Coach Wooden was the head coach at UCLA, and during his coaching reign he won 10 NCAA championships in 12 years and also won 88 straight games which still remains a record today for the Bruins. This story emphasizes Wooden’s feelings and his beliefs that he has carried all the way from his early childhood in a farm in Indiana. He shares these beliefs with us in order to show how they work in life, and also why should we act in this specific way or form. This book is supposed to be a book in which you can reflect on your own life and see where your weakness are, and then well strengthen and also fix that specific weakness that you are having in your life. This book I would surely recommend to every age. Coach Wooden has been a role model to me, and I am very sure he will be a strong example of a role model to you as well. The life of a remarkable, and humble hero– Coach John Wooden. This entry was posted in Book Reviews and tagged john wooden, memoir, nonfiction, sports by Robert N. Bookmark the permalink.